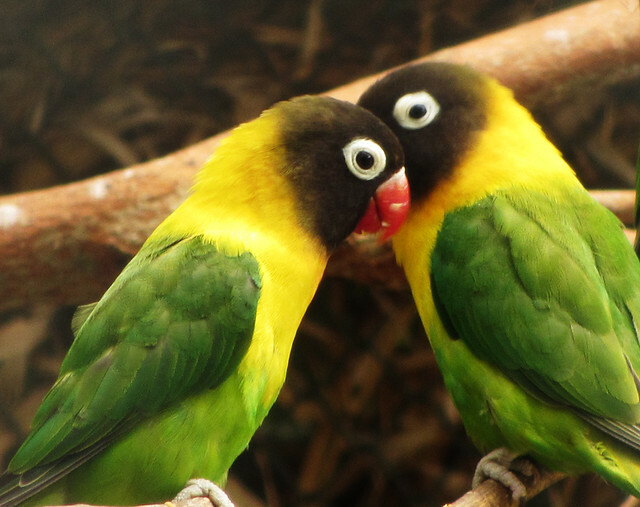 Lovebirds are intelligent birds that kept as pets in most homes. If we ask a person what a lovebird is, then the most common answer you are likely to get is that. Lovebirds are friendly, energetic birds from the parrot family which is kept as pets by many people. These birds are tiny that look like the parrots. However, these birds come in many different colors. Their faces are big with strong beaks and the color of the face is generally brighter than the rest of the body. There are many different kinds of species and their color also varies accordingly. Most often, young lovebirds have a black band on top of their bill and this fades away as they grow older. Lovebirds belong to the genus called the Agapornis, which is derived from the Greek word ‘agape’ which means love and ‘ornis’ means bird. There are nine kinds of species in love birds and all of these belong to the native of Africa, except one. The Grey-headed lovebird is the only one which comes from the island of Madagascar. The black-collared lovebird is the only forest-dwelling bird. Apart from this, all the other kinds live near the equator in the dry Savannah regions. The lovebirds like most birds also live in flocks that range from a few to more than eight hundred birds. Larger flocks are formed around areas where there are food and water available during the dry seasons. They eat a wide range of foods from the wind like leaves, fruits, nuts, twigs, seeds, and occasionally insects and small animals as well. Out of the nine species three of them are kept as pets. However, it is very difficult to differentiate male and female in this species. However, both of them can make up to be very good pets. Three species which can be kept in our homes are Fishers Lovebird, Masked Lovebird, and Peach-Faced Lovebird. The Fishers Lovebird has a bright white circle round his eye making him one of the ‘eye ring’ species. His wings are dark green in color although he has a light green color body. Its beak is orangey red in color with a piercing voice. The Masked Lovebird is also one of the ‘eye ring’ species. It has a black color face and head making it look like a mask. The body and wings are green in color while its chest and neck are yellow. This is a very playful and affectionate pet for many. The peach-faced lovebird is the most commonly kept lovebird. It has green wings with a blue color on edges of its feathers and tail. The color of the face and neck are a variant peach to pink color and a pale pinkish tan beak. This bird is also an energetic and devoted lovebird. However, there is a wide variety of lovebirds found by the pet industry and from the breeders. Some of them are Abyssinian Lovebird, Albino Lovebird, Black Masked Lovebird, Dutch Blue Lovebird, Fischer’s Lovebird, Lutino Lovebird and Peach-faced Lovebird. The breeders also provide guidelines and best ways to keep your birds healthy. Also, today you find different kinds of housing facilities available for your birds depending on the space required. These are also named differently like a bird cage, bird perch, bird hide or nest box, Aviary. My friend Cody has an Aviary just in front of his house where he breeds about 50 lovebirds. He spends most of his day with them. When I tried entering into it, an alarm went off and discovered that he had attached the birds' nest to the ADT Security Systems installed in his house. I was very Inspired by the varieties of lovebirds that Cody had in his aviary.